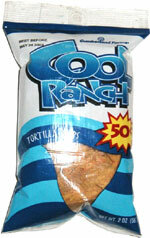 Taste test: We were kind of expecting a Cool Ranch Doritos flavor, but we were highly disappointed in this chip. The tortilla chip was awful, as if they took stale taco shells, broke them up and then poured some flavor powder on them. Clearly not the 'Mac Daddy' of all snacks. Smell test: Not a very good aroma, seems kind of a stale air. This snack was discovered by Keith at Cumberland Farms at the Cleghorn rotary, Fitchburg, Massachusetts. Review published .